"Million Drops Collection" Each Sterling Silver Bead is created by hand. 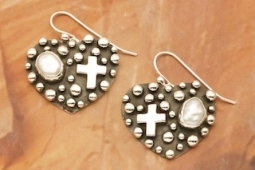 Genuine Freshwater Pearls set in Sterling Silver Heart Earrings with a Sterling Silver Cross Design. Created by Santo Domingo Artist Raymond Coriz. Signed by the artist. French Wire Earrings are 1" L x 1" W.